The combination of cell fractionation and electron microscopy opened a new frontier in biology, making possible the visualization of the cell’s interior contents and determining their biological functions. In 1930, the Belgian biologist Albert Claude, at Rockefeller University, devised the process of cell fractionation, in which a cell is ground up to release its contents and centrifuged at different speeds to separate the contents according to weight. Claude’s cell fractionation process was refined in 1955 by his student George Palade, a Romanian-born American, who used theelectron microscope to study these cell fractions. Palade was first to identify and describe “small granules,” which were given the name ribosome in 1958, and found to be the site of protein synthesis within the cell. Claude and Palade (the latter often called the father of modern cell biology and the most influential cell biologist ever) were co-recipients of the 1974 Nobel Prize. THE PROTEIN FACTORY. All living organisms have ribosomes within each of their cells that are directed by the genetic code to function as factories, carrying out the synthesis of proteins. Cells having high rates of protein synthesis, such as the pancreas, have millions of ribosomes. DNA carries instructions to messenger RNA (mRNA) for building specific proteins. Transfer RNA (tRNA) then brings the amino acids to the ribosome where they are sequentially added to a growing protein chain. Ribosomes found in eukaryotic cells (animals, plants, fungi) and prokaryotic (bacterial) cells have a similar structure and function. In the former, they are attached to rough-endoplasmic reticular membranes and, in the latter, suspended in the cytosol, the fluid component of cytoplasm. That ribosomes are found across all kingdoms of life suggests that the ribosome evolved early in the evolutionary process. Palade determined that ribosomes are made up of large and small subunits and that there are subtle differences in density (mass per unit volume) between the ribosomes in prokaryotic and eukaryotic cells. This is of practical significance in the treatment of bacterial infections. Certain antibiotics, such as erythromycin and the tetracyclines, selectively inhibit the protein synthesis in bacteria without having such effects in the patient’s cells. SEE ALSO: Prokaryotes (c. 3.9 Billion BCE), Eukaryotes (c. 2 Billion BCE), Cell Nucleus (1831), Cell Theory (1838), Antibiotics (1928), Electron Microscope (1931), Lysosomes (1955), Cracking the Genetic Code for Protein Biosynthesis (1961). The primary function of ribosomes is the manufacture of proteins. 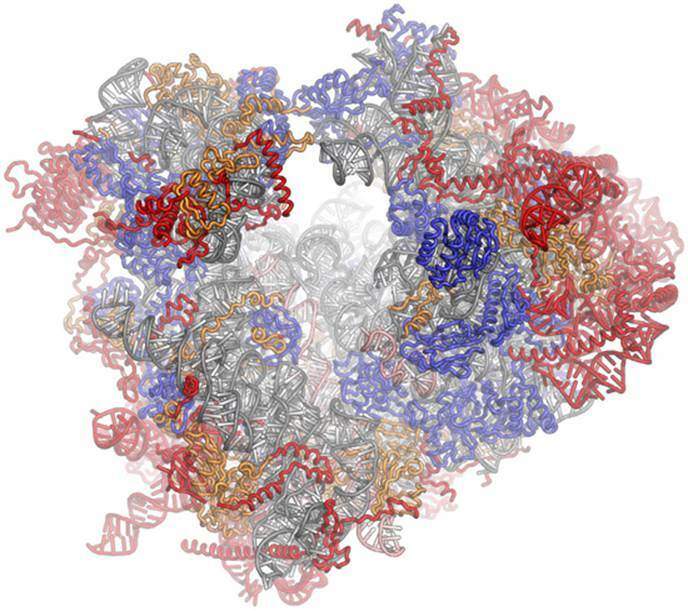 The image depicts a model of a eukaryotic ribosome, which differs in structure from a prokaryotic ribosome.